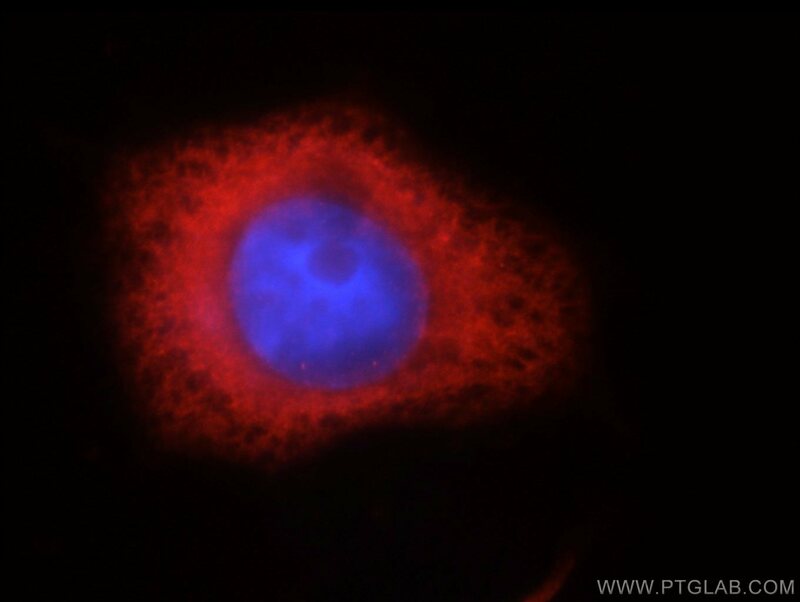 Immunofluorescent analysis of MCF-7 cells, using IGF2BP3 antibody 14642-1-AP at 1:25 dilution and Rhodamine-labeled goat anti-rabbit IgG (red). Blue pseudocolor = DAPI (fluorescent DNA dye). 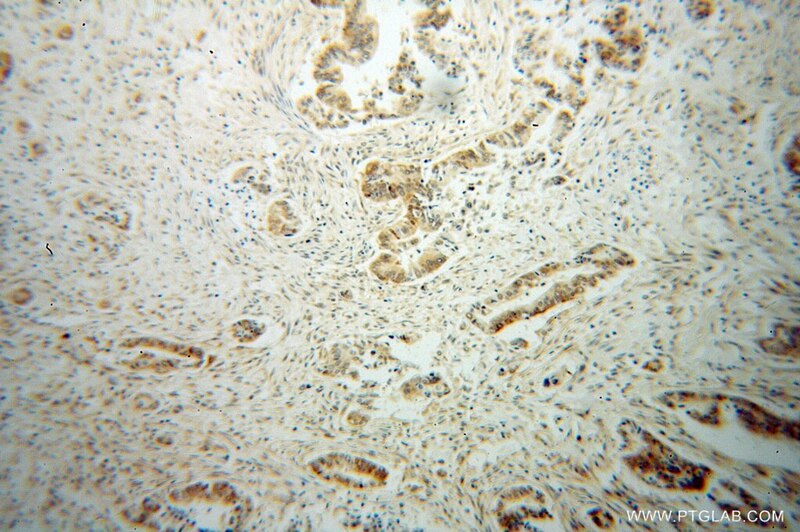 IP Result of anti-IGF2BP3 (IP:14642-1-AP, 3ug; Detection:14642-1-AP 1:1000) with HeLa cells lysate 4400ug. IGF2BP3, also named as IMP3, KOC1 and VICKZ3, belongs to the RRM IMP/VICKZ family. It is one of the RNA binding proteins involved in mRNA localization and translational control. IGF2BP3 is expressed during embryogenesis, as well as in some malignant tumors. It can be used as an independent prognostic factor for osteosarcoma. 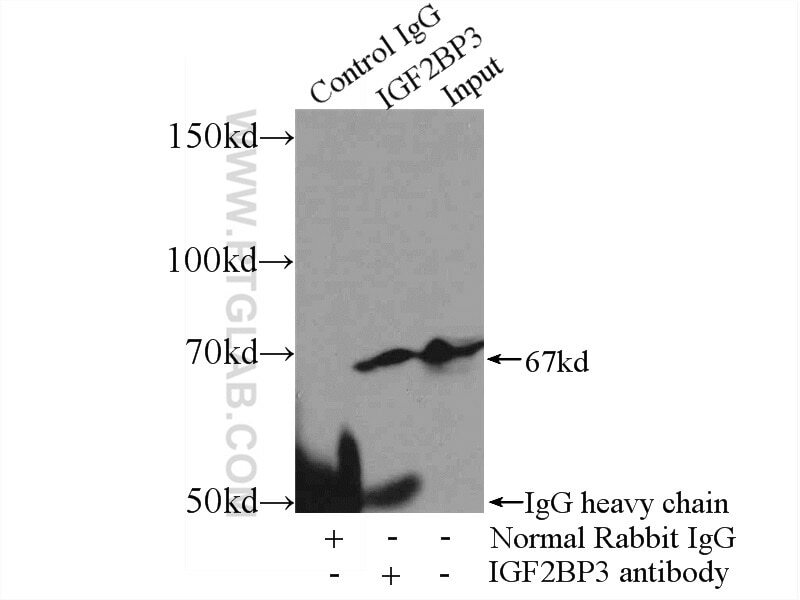 Both isoforms (64kd and 22kd) of IGFBP3 can be recognized by this antibody. And IGFBP3 is nuclear and cytoplasm stains. Also binds exogenous expressed IGF2BP1-GFP protein. I also get a double band around 70 kDa that is likely IGF2BP1 and IGF2BP3. This antibody is not specific. Thank you for taking the time to review this antibody. Due to your feedback, we are going to put this product through our QC process again and, if it does not pass, we will re-examine our production process and make a new lot. Role of IGF2BP3 in trophoblast cell invasion and migration. Lin28b is sufficient to drive liver cancer and necessary for its maintenance in murine models. C1QBP Negatively Regulates the Activation of Oncoprotein YBX1 in the Renal Cell Carcinoma as Revealed by Interactomics Analysis. 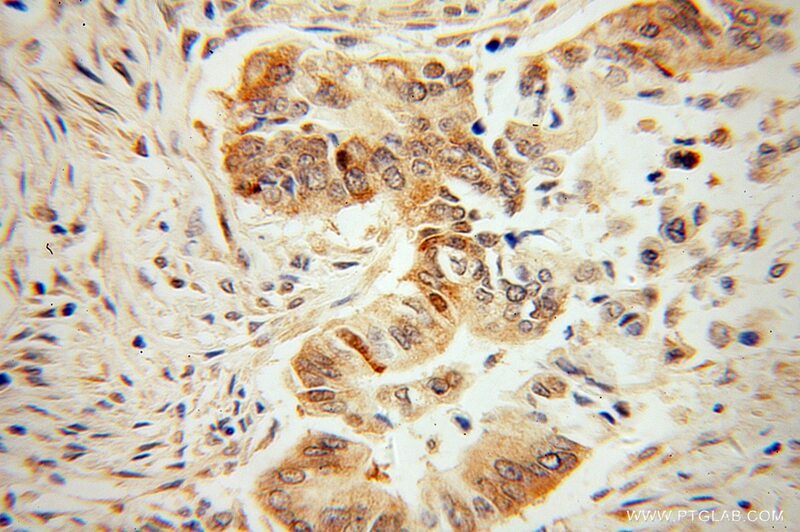 Expression of the cancer testis antigen IGF2BP3 in colorectal cancers; IGF2BP3 holds promise as a specific immunotherapy target. SIRT6 Suppresses Pancreatic Cancer through Control of Lin28b.